Look no further. We offer a wide range of janitorial services for your convenience. Our main focus is in the Commercial Cleaning industry. We've been serving top quality janitorial (office, restaurant, schools, buildings, churches, synagogue, banks, supermarkets, medical offices, dental offices, health clinics) cleaning services in the Greater Boston Area since 2002. Last time we've checked, we were number 1 on Google for the keywords: "office cleaning services Boston". 90% of new clients come from word of mouth from one client to the other. Several clients you see below were referred by another client in this same page. When a company does a great job, referral is like a reward. This is the reason why so many commercial facilities trust Boston Quality Cleaning Services, Inc. to take care of their places. And we are so proud to be the ones chosen. The six-year-old commercial cleaning company is a family affair, operated by Jean Carlo and Marli Paes. Boston Quality Cleaning Services, Inc. offers personalized service unmatched by common cleaning services. Once the crew has completed its thorough, top-to-bottom cleaning, each office is inspected by one of the owners, who makes sure that the checklist has been completed and every special request from the customer has been met. Boston Quality Cleaning Services, Inc. handles the interior cleaning of doctors’ offices, churches, industrial buildings and other businesses throughout the Greater Boston area. The company is also a a proud member of the Better Business Bureau. 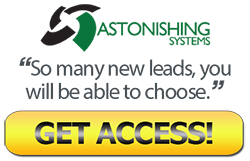 Priding itself on surpassing expectations, The Boston Quality Cleaning Services, Inc. offers prospective clients customized estimates with a built-in guarantee. “We do what we say we’re going to do,” Marli Paes says. “We’re committed to building relationships with our customers.” Several Forbes 500 companies are among our clientele. 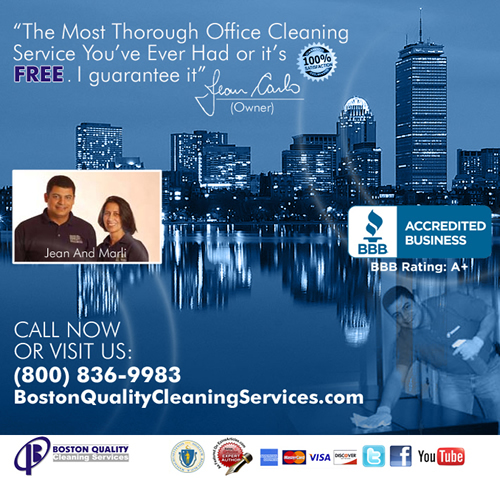 Boston Quality Cleaning Services, Inc. is a fully insured (liability + works comp) company. We know from experience how important it is for any serious company to be protected with insurance. Jean Carlo, one of the owners of Boston Quality Cleaning has an interesting story to tell about insurance. Back a few years ago Jean was working as an employee for a commercial cleaning company in the Boston Area. He witnessed an employee of that company (which we prefer to keep nameless), to drop a fair amount of Chlorine on the carpet of a famous restaurant. That left a big white stain on the floor which could not be removed. Without the insurance coverage from that cleaning company, the restaurant would be in financial trouble. When choosing a commercial cleaning company one of the most important things to look for is experience and detail orientation. Why? Because the "look" of offices reflect on the performance of their employees. A neatly detail cleaned office will send a message to the employee that the company does care about cleanliness. A clean office will also project an image of success to other companies. Companies like to do business with successful companies. Remember the saying in business: "like attracts like". After several years cleaning commercially, we became very detail oriented. We know that we need only one complaint from one employee from an entire 100-employee company to ruin our reputation. We take no chances. Clean for us means absence of dirt, including dust, stains, bad smells and so forth. Copyright © 2013 Boston Quality Cleaning Services, Inc.